Kevin Paredes/Photo Editor Yaa Takyiwaa is the president of the Binghamton University chapter of Pretty Girls Sweat. She is a senior double-majoring in integrative neuroscience and comparative literature and a group fitness instructor at the East Gym. “This organization embodies what I think I am as a person: someone who helps to uplift women,” Takyiwaa said. PGS is a national organization that began in 2011 to support former first lady Michelle Obama’s “Let’s Move!” campaign — an initiative with the goal of reducing childhood obesity and encouraging a healthy lifestyle among children. The organization’s BU chapter began in fall 2015 and became an SA-chartered organization in 2017. 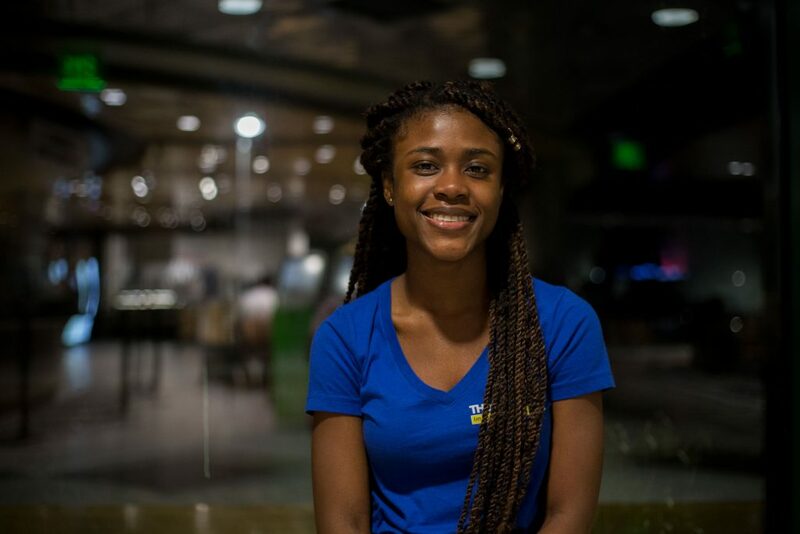 Takyiwaa has been involved with PGS since it first arrived on campus. Through the sweat sisterhood and fitness parties or sweat shows — weekly exercise workshops held every Friday — PGS enables participants to engage in open discussions about obstacles they may face in today’s society, to learn about nutrition and how to lead healthy lives, and to celebrate women who use their platform to promote a healthy lifestyle. PGS is rapidly growing and currently has 19 university and two graduate chapters, while serving over 20,000 participants in eight cities across North America. The organization is also active on many social media platforms including Facebook, Twitter and Instagram, which people can follow to learn more and stay up to date on events. Takyiwaa joined PGS in the beginning of her junior year as the workout coordinator. She is also a group fitness instructor at the East Gym, where she teaches Zumba and Booty Boot Camp. She is also a huge proponent of putting your health first. To learn about Takyiwaa’s favorite workouts, click here.